The Beatles 50 Years Ago Today: December 3, 1966. Beatles Radio: The Beatles, Solos, Covers, Birthdays, News The Fab 4 and More! I enjoyed interviewing Ringo. For one thing it meant a pleasant drive out of busy, congested Central London, into the sunny, stockbroker belt of Surrey; and secondly, because Ringo is one of the easiest-to-get-on-with people I know. As I drove in through the massive, light-colored wooden gates, which mark the entrance to the Starkey estate, Ringo walked round the corner of the house. "Park it over there," he said after smiling a greeting. "Come into the house." We walked through the hall and turned left into one of the largest and most sumptuous rooms I have ever seen. Wall-to-wall, charcoal-grey carpet moved silently under our feet as we walked around. "Take a seat," said Ringo, plonking himself down into an easy chair. He was wearing a plain, casual, light-grey sweater, blue chalk-striped trousers and leather moccasins. The usual gold chain was around his wrist and four rings on his fingers. "OK, what do you want to ask me?" I asked, "Do you think you've changed a lot in the past four years," hoping to avoid one of those silly questions that the Beatles get put to them at the start of every interview. "Of course I have," he replied instantly, "Who doesn't. I don't think anyone just stands still. If you do nothing else, you get older. But sometimes I'm quite sure it's someone else who they're talking about in the paper." "The last four years have been so different from anything I knew when I was young. Of course, we had a lot of good times before we made it. It wasn't all a tough grind." Do you like your life now, I asked. "Yes, definitely," said Ringo. "I didn't know whether I would like living in the country when we came here, but I find it great. I got fed up with the flat in town because it was impossible to relax. I was always being chased for some reason or another. Here it's different. You can get away from everything. John and I have even tried to go out a bit." I was fascinated by this. Did Ringo really mean that he and John had made a habit of visiting the local pubs? "Yes, that's right," Ringo said, "We did just that, but it didn't work. Most of the regulars used to accept us. Many of them, of course, were businessmen who didn't care about the Beatles. But you always get the blokes who ruin it by making a fuss." As I had driven up to the house, I noticed there was a golf course behind it. I asked Ringo if he played there. "No," said Ringo, "I wanted to join but they wouldn't let me. Told me they'd got a three-year waiting list and I'd have to join on the end of the queue. I'd like to get in so that I could kid people it was my golf course at the end of the garden." I noticed a small keyboard amoungst the furnishings, but no drum kit. I asked Ringo if he ever played the drums at home. "Very seldom. I don't believe in practicing really. I learned to play with a group and I believe that I progressed more with them in five weeks that I would have in six months rehearsing by myself in an attic." I asked him about Zak (Ringo's young son). Did he like Beatle music? "I don't think he knows the difference between Beatle music and other music, but he certainly seems to enjoy it. He dances to records now." I suddenly had visions of a little Ringo in an Eton collar and asked Ringo where he'd send him to school. "I haven't thought about it very much yet. I don't particularly like the idea of him going to a public school, but the difficulty is that all the other boys he will play with around here will go to one, and he'll feel different if he doesn't stay with his friends. But then you never know what may happen by the time he's due to start." What does Ringo do with his spare time? "I run Bricky Builders, but they don't seem to be making much of a profit outside the Beatles." How come, I asked. "Well, after they finished working here, they moved on to John's place to do something for him, and I believe George has got some ideas he wants to use them for when they've finished at John's." What about the Beatles' future plans? 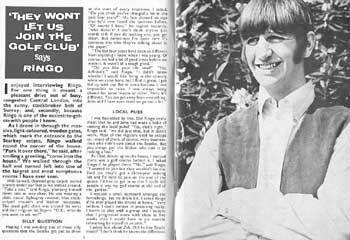 "Everyone keeps asking about that," said Ringo. "The trouble is it's difficult to answer because we don't have everything cut and dried ourselves. Sometimes I feel that people think that we've got a big list of things to do for the next two years stuck on a wall, and we just can't be bothered to tell anyone about it, or want to keep it hidden or something. It's just not true. None of us have got any spare material, so John, Paul and George have to write new stuff before we go into the recording studio each time." "Also, we're waiting on the film. We can't write the film script ourselves. We don't know how, so we have to wait for somebody else to produce one... then we can read it and see if it's OK. The trouble is, of course, that everyone keeps talking about it. I suppose they can't understand why we haven't made another two films by now. The answer is, we don't want to make 'just another film.' The scriptwriters kept on offering us different versions of 'Help' before we found the bloke we've got now." "That's enough questions," said Ringo. "Let's have a cup of tea," and he disappeared out of the room to return a couple of minutes later with a tray, two cups, teapot, a bowl of sugar, and a plate of Munchmallows. I can't think of a better way to end an interview with a Beatle than having tea with Ringo.